This is especially true when it comes to the issue of cars: when I was considering selling ours, you’d have thought I was putting the kids themselves on the market. But it’s not. We live in the downtown core, where everything is walkable. So hand in hand with offloading our money toilet – er, car – was my plan to teach the kids to rely more on public transit, the way I do. Earlier I wrote about our ongoing transit experiment. 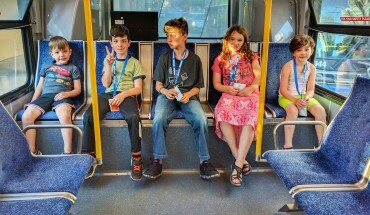 Car or no car, I feel that this is a hugely important skill for my brood to have: As parents, one of our primary goals is to teach our kids how to live without us, and to that end, the independence that comes with public transit mastery is invaluable. The self-esteem payoff for kids is equally huge, leading them to believe they can tackle anything – in school, in their friend group, at home and beyond. 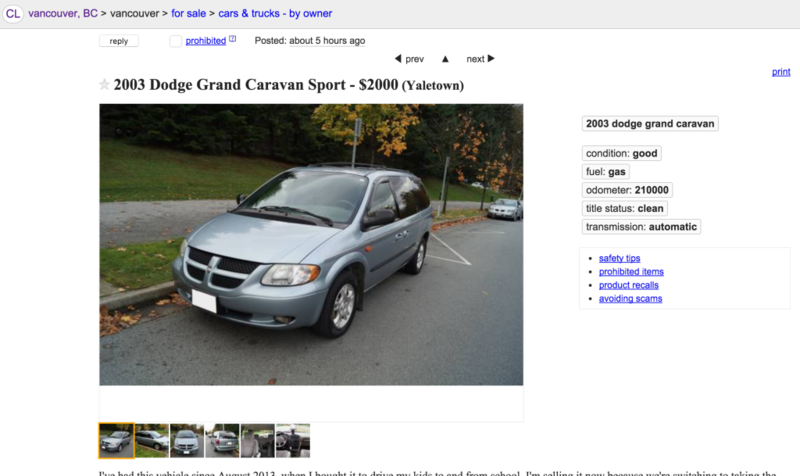 My focus, as I said, is the “no car” part of that equation, for several reasons. First, driving a car is the single most risky thing we do every day. About 100 people a day die due to car crashes in the US alone. Loading five kids into a car is literally putting all your eggs in one very frail basket surrounded by, well, things that break eggs. Cutting personal auto reliance out of our lives reduces risk dramatically. 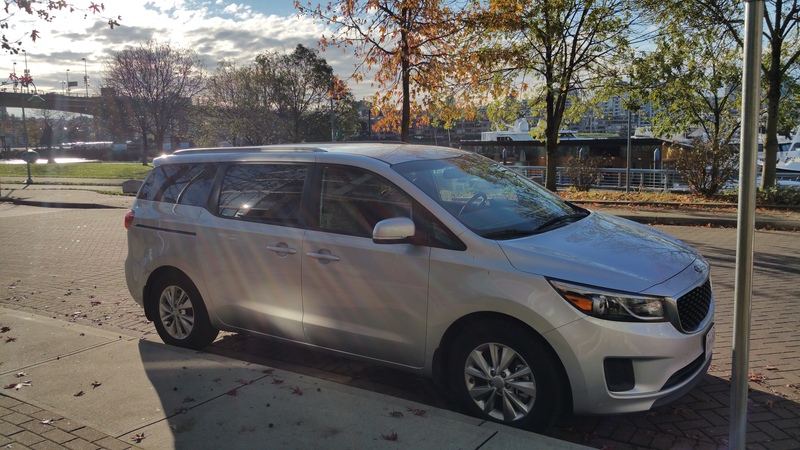 This is a 2015 Kia minivan, part of the Modo carshare. It costs just $8/hour to rent! Second, owning a car is financially ruinous. Transit and car sharing are pay-per-use propositions – sans automobile, we have no lingering responsibility for repairs, insurance, gas, etc. I’d rather spend our family’s limited funds on experiences than on owning a car. Before committing to selling the car, I ran some detailed spreadsheets. I analyzed the cost of car ownership (specific to our car) versus taking the bus, more car shares and occasionally renting a vehicle for road trips. Giving up personal car ownership always came out as the best option. 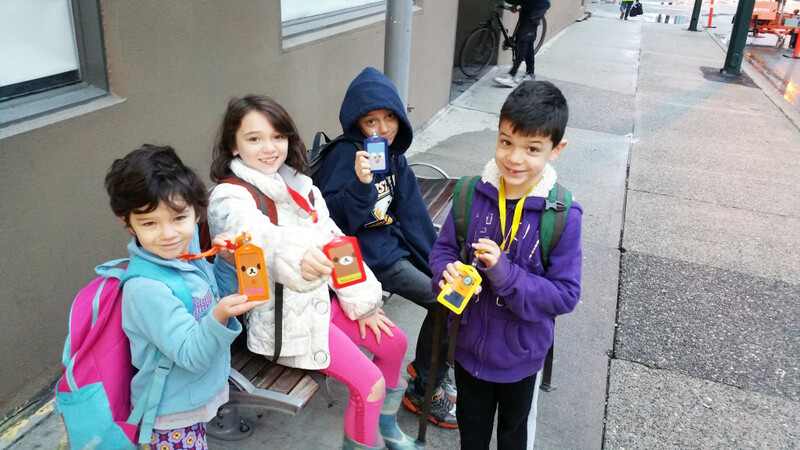 The kids proudly display their Compass cards (transit passes) on our first official day of car-free living. Third, there’s also a very real psychological cost to maintaining a vehicle. It breaks, you worry. You crash, you worry. Even driving it takes a toll – you worry about your responsibility in piloting such a dangerous machine (or at least you should worry). You feel powerless stuck behind the wheel in traffic. I’d rather leave those stresses to others. Last, the socializing that comes from regular exposure to public transit isn’t something that chauffeured kids get. If all your kids see every day is the Napa leather of your Volvo’s interior, don’t be surprised when they have trouble parsing the behaviour of people who don’t own luxury rocket ships. Empathy and situational awareness are at the opposite end of the spectrum of human understanding from the self-involvement that can come from living in homogenous environments. The kids, commuting to school beside adults and students. Our family is currently in just week three of carless-ness and the transit experiment is going well. 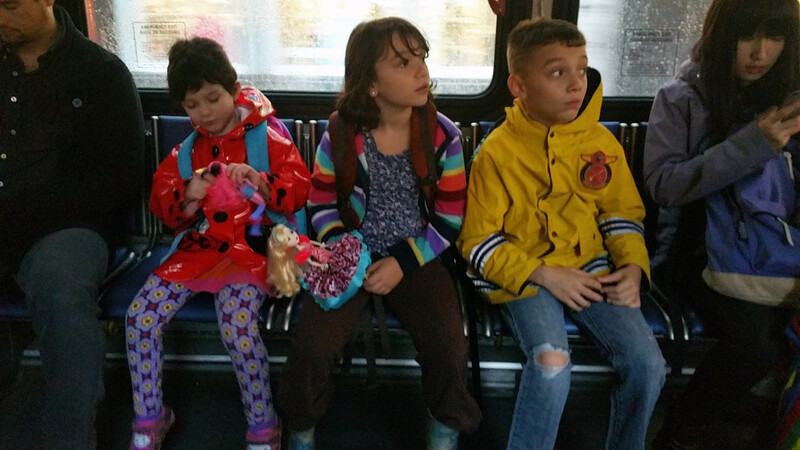 The kids love the adventure and independence of the bus, Vancouver car-shares fill the occasional car need and I’m released from the worry – safety and financial – of daily car ownership. It’s hard not to feel good about a decision like that. 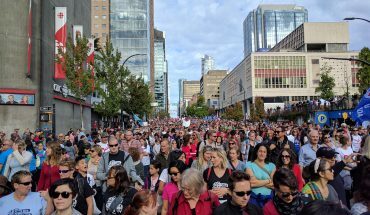 Great blog, Adrian, I’m glad I found it (like many, I’m sure, I saw you on CBC). 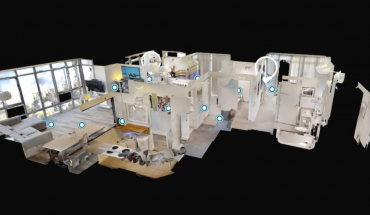 I’m always glad to find a kindred spirit in putting quality of life ahead of square footage and toys. Our family lives car-free too, in Halifax, where real estate is quite affordable (by Vancouver standards). So though we don’t live in 1,000 square feet, we live in a small house within walking distance of downtown. I agree and relate to all your reasons for living car-free–and I’d add one more. Casual discoveries. When we’re walking with the kids (7 and 4), they see, smell, and discover things they never would from a carseat. The notice bees on flowers, and we stop to watch. They notice worms in puddles, and we stop to check it out. We take detours through parks, smell flowers, and pet dogs. The entire trip is a series of fascinating moments. Compared to when we use carshare (which is rarely), the journey feels like a part of life, instead of putting life on hold. Thanks again for the blog, look forward to following you on it and Twitter! You’re so right. That ability to just stumble upon things in your city is so much more valuable than blasting through them in a car. Also gives the kids a much better sense of how everything is connected, rather than just a collection of destinations they’re driven to. Pretty cool! Thanks for saying hi and the kind words!